The Around the World with 80 Schools project has grown tremendously over the last year. It has grown so fast that it was becoming very time consuming to manually enter contact information for a group email list, invited participants manually to a wiki, add their location on a Google Map, and maintain a Google form/spreadsheet with the participants' contact information. A few short days (!!!) after the Ning for the Around the World with 80 Schools was created, an announcement from Ning spread like wildfire across Twitter and other social network platforms. Ning had decided that it would be discontinuing its free accounts in the upcoming months. I was eagerly following the news to find out, if they would be an exception for Educators (similar to wikispaces) I had the hope of being able to keep the newly formed and thriving community for AWW80S. Then a rumor started circulating that there WOULD be an option for educators. The rumor was confirmed when the following appeared on their pricing options website. Checking into the Mini-Network, it appears that it would be limited to 150 members. So it would NOT be an option for the AWW80S community. :( I had to start looking for other options, since I would not be able to invest in addition to the administrative time and effort an additional $2oo a year, nor did I want to start charging members for participating in the project. I heard of WordPress MU and the BuddyPress plugin as a possible option. Since I am quite familiar with the WordPress platform (Langwitches and about 100 other sites, I have created and administered over the years are built on WordPress), it seemed a logical option for me to be checking into. Social networking in a box. Build a social network for your company, school, sports team or niche community all based on the power and flexibility of WordPress. BuddyPress is completely free and open source. Unlike hosted services, BuddyPress allows you to stay in control of your site and create a totally customized, unique experience. 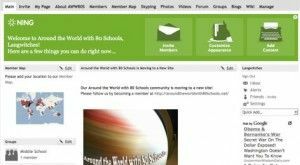 I purchased the domain name "aroundtheworldwith80schools.net" and with the help of Christopher Rodgers, manually install WordPress MU on my hosting company's server and activated the BuddyPress plugin. Christopher has even created a step-by-step tutorial (with screenshots!) to help you through your own install of Buddypress. He is going even further and offering his time (via Skype) to anyone who needs a little extra with the install. Thank you Christopher!!! At the request of my friend Silvia Tolisano I have decided to put together a step by step tutorial for installing Buddypress for you do-it-yourselfers out there. However, if this process seems to complicated to even attempt I will help anyone, that’s right anyone install Buddypress via a Skype session or two. That’s how much I am committed to open-source! If you are interested in having me help you set up Buddypress just contact me. After a few glitches (users were not able to create their own blog as "theirblogname.aroundtheworldiwth80schools.net), a re-install of the database and making any new blogs created the following hierarchy "aroundtheworldwith80schools.net/theirblogname", the new AWW80S community seemed ready to roll. I was ready, as we say in Argentina "tirarme a la pileta" (to throw myself into the pool) , which loosely means "to do something that you have never done before, not knowing what the outcome will be". I sent out a an e-mail via the original e-mail distribution list, then a message to all members of the AWW80S Ning and the members of the AWW80S Wiki to let them know about the situation of the impending termination of the free service via the Ning and to request their migration to the self hosted site. It was a little scary to announce that the thriving and active Ning community will be deleted soon. The biggest worry is that the 300+members will not take the time to create a new account at yet another site. I felt that active members who have seen the value and reward of participating in the community will follow and take the plunge of saying goodbye to the Ning platform. So far so good. In the last few days over, over 75 members have created a new account, 20 blogs have been created through the main site and 13 groups are active. The site has a very "ningish" feeling to it. I am sure there will be more glitches as well as positive surprises with this new platform, but I am very happy with the possibilities it offers for the Around the World with 80 Schools community. If you are a Ning creator/administrator and faced with the decision of what to do with your Social Network community, I hope I was able to give you an alternative and aid in the decision of saying goodbye to Ning.